Was KTM 390 Adventure launch update a marketing move to take on BMW G310GS? As we all know, KTM 390 Adventure has not made its debut at the 2018 EICMA show. You could sense the excitement on the show floor in Milan, as well as on the Youtube page where a LIVE webcast by KTM was about to commence. I asked my colleague who was attending EICMA, how is the situation? Did you get a good seat to click images? He replied, saying there was a lot of crowd, most he has seen today for a conference. And why not? It was after all going to be the expected global debut of the Duke 390 based adventure motorcycle. Everyone was happy and eager, you could see it in the faces, and read it in the comments section of the Youtube LIVE webcast. The conference started with KTM talking about their MotoGP season, their racing driver coming on stage. Then talking about off-road motorcycles. They unveiled one off-road bike, then the another and another. And when it was time to unveil the last covered bike on the KTM stall, we thought, this is it, here is the biggest surprise. But guess what. It wasn’t. The press conference was over. Hosts left the stage, and opened the floor for media. It was disbelief as to what just happened. Where is the KTM 390 Adventure? Will it jump off the back stage now? Well, it was not there. It took some minutes to understand what had happened before we moved on to the next event, as there was no point to stay at KTM any longer. 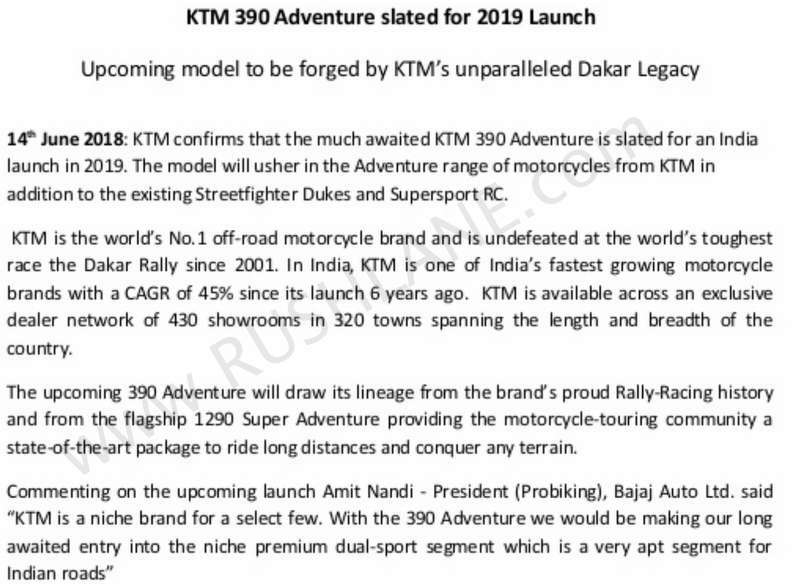 390 ADV update shared by KTM India back in June 2018. So, why was everyone expecting KTM 390 Adventure to debut at the EICMA? Well, it is because of the press update which was shared by KTM India back on 14th June 2018. In that they confirmed that the KTM 390 Adventure will be launched in 2019. 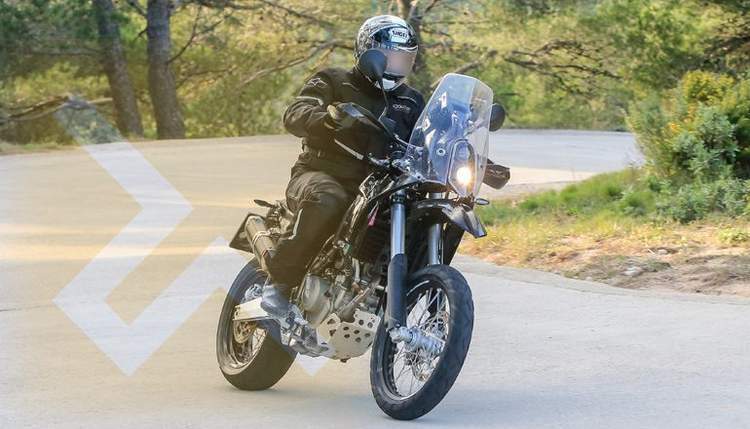 As has been a norm over the years, they showcase the bike at EICMA in November, and launch it next year in India – happened with new Duke 390, so the same was expected of 390 Adventure. This is why thousands of us were waiting for the 390 Adventure when the KTM press conference at EICMA started. Overdrive caught up with KTM officials and asked them the question where is the 390 Adventure? They simply put it this way – that media misinterpreted the release shared by KTM India. As per them, they never said that the debut is at EICMA 2018 (which is correct). They simply said that the launch is in 2019. So the deal for 390 Adventure, now seems to be like this – debut at EICMA 2019; which is in November next year. After that, launch the bike in India, open the bookings, to prove their June 2018 update shared was right. Expect sales to start by early 2020. Two questions arise. If media interpreted the June 2018 press update wrongly, why was it not corrected by KTM India? Second, if the bike is going to be launched by end of 2019, why was the release shared in June 2018 – almost 1.5 years ahead of probable launch? This brings us to BMW G310GS, the Indian launch of which was announced just days prior to the KTM India announcement of 390 Adventure. At that time, excitement soared high for the BMW twins – G310R and G310GS. Many bikers were getting ready for a purchase. Was the timing of announcement of KTM 390 Adventure a marketing move to reduce the excitement around BMW G310GS? Well, it seems that could have been the case, considering that 390 Adventure is nowhere to be seen at EICMA 2018. But if it was, KTM should have not bothered much, as the price of BMW 310R and 310GS are noteworthy enough to make buyers cautious.